A Jesuit High School for the Sacramento area had been initially envisioned by the late Bishop Robert Armstrong. It was his successor, Bishop Joseph McGucken who invited the Jesuits of the California Province to begin the project. In January of 1961, the Society of Jesus purchased twenty-one acres of the Horst Ranch property which was to be used for the new school campus. In May of 1962, a fund raising effort was spearheaded by Mr. Elwood Maleville, Mr. Jack Maleville, and other Catholic lay people. The well known architect Harry Devine began work on the plans for the first phase of the 2.5 million dollar plant. The contracting firm of Harbison and Mahoney undertook the construction of the buildings, having a fall 1963 target date for completion. 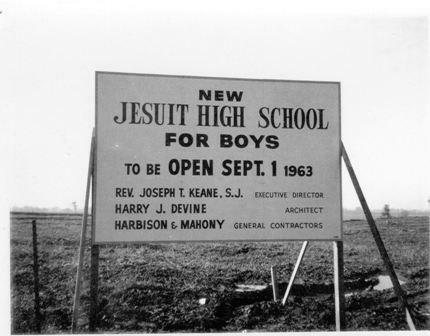 On September 17, 1963, Jesuit High School opened its doors to 93 freshmen students. The faculty consisted of six Jesuit priests and one lay person. Fr. Jack Geiszel, S.J. was appointed Principal, and Fr. Joseph Keane, S.J., was named first Superior and President. The school was dedicated by Bishop Alden Bell to the Jesuit North American Martyrs. In September of 1964 twenty-one acres, known as the Haggin Bottomland, were acquired for athletic facilities. The faculty residence was enlarged in 1966, and two years later the gymnasium-little theater complex was completed. In 1973-74, Jesuit High School was threatened with closure due to financial and manpower difficulties. An “Ad Hoc Committee to Save Jesuit High School” was formed to work out the serious problems facing the school. A Board of Trustees, under the leadership of the late Mr. James Carr, the head of the Ad Hoc Committee, was established and assumed the financial and policy-making responsibilities for the school. The Jesuit Order retained its role as administrators of the school. The Board of Trustees, which is composed of five Jesuits and eighteen men and women, is dedicated to maintaining the high standards of Jesuit education in the Sacramento area. Jesuit enrollment has increased over the years to a current level of 1,000 students. Recently there have been many improvements on the campus. In 1978-79, the school sponsored a scholarship development drive and provided the basis of funding for the new library addition which opened during the 1980-81 school year; it also provided increased scholarship aid to families needing financial assistance to send their sons to Jesuit. In May, 1982, the library was dedicated by Bishop Alden Bell to Rev. Joseph J. King, S.J. In 1986, construction of a competitive swimming facility was completed. In 1992, a new Mathematics/Life Sciences classroom wing was completed. Construction of the new Student Life Center which includes a cafeteria, theater, and music rehearsal and performance space was completed in fall, 2000. Over the summer of 2003, Alumni hall, a 5 classroom building outfitted with the latest technology, replaced room 705. Also, new offices were built for Campus Ministry and Christian Service in the 300 wing and new counseling offices went into the 100 wing. Jesuit High School continues to be blessed with the strong support of the students, alumni and their families, together with the good will and interest of the many friends of the greater Sacramento community.